Dica do Celso: a promoção contempla a quase totalidade dos continentes em que há presença da Accor, sendo que as datas de marcação das reservas e das hospedagens variam muito, conforme o país ou continente. Vale destacar que é preciso ser associado do Le Club Accor Hotels (inscrição gratuita) para conseguir obter os descontos. Offer valid for booking from 14/11/2017 to 23/11/2017 for stays from 28/11/2017 to 31/05/2018 in the Middle-East and Africa regions/ bookable only on accorhotels.com and AccorHotels’ group websites. The up to 50% discount is based on the lowest unrestricted rate. Hotels in Japan are not participating in this offer. The special discounts is exclusive to Accor Plus, Le Club Accorhotels members and subcribers to AccorHotels Group websites. Offer is subject to each hotels’ conditions and availability. This Promotion cannot be combined with any other offer(s). The special discounts (30% off) are only valid in participating hotels only and are subject to each hotels’ conditions and availability. This offer can be booked from 14 November 2017 to 23rd November 2017 on AccorHotels Group websites. The special discounts are based on the Best Unrestricted Rate and apply to stays for all hotels (except those in Sydney and Melbourne) between 1 December 2017 to 31 May 2018, and apply to stays in Sydney and Melbourne hotels where stays are between 1 December 2017 and 11 February 2018 and between 26 March 2018 and 31 May 2018. To confirm your booking, the non-refundable payment of the stay is entirely deducted upon booking. To the extent permitted by law, no cancellations or changes are possible. This promotion cannot be combined with any other offer(s). Le Club members can accumulate points with this booking. ACCOR PLUS Members receive an additional 10% discount on this promotion. Exclusive Sale (40% in Sofitel,MGallery,Pullman,Mercure, Novotel and Novotel Suite and 30% ibis and ibis Styles) is only valid at participating hotels. This offer can be booked from 14th of november to 23th november 2017 at Accorhotels.com. See the arrival dates at the sale. Special discounts are based on the best unrestricted rate (rate without conditions). Exclusive Sale (up to 40% in Fairmont, Swissôtel, Sofitel,MGallery,Pullman,Mercure, Novotel, Novotel Suite, ibis, ibis Styles) is only valid at participating hotels. This offer can be booked from 14th to 23rd November, 2017 on AccorHotels Group websites. See the arrival dates at the sale. Special discounts are based on the best unrestricted rate (rate without conditions). The breakfast is included for ibis styles. This offer can be booked from 14th to 23th November 2017 on AccorHotels Group websites for stays from 9th February 2018 to 11th March 2018. The special discounts are based on the Best unrestricted Rate. 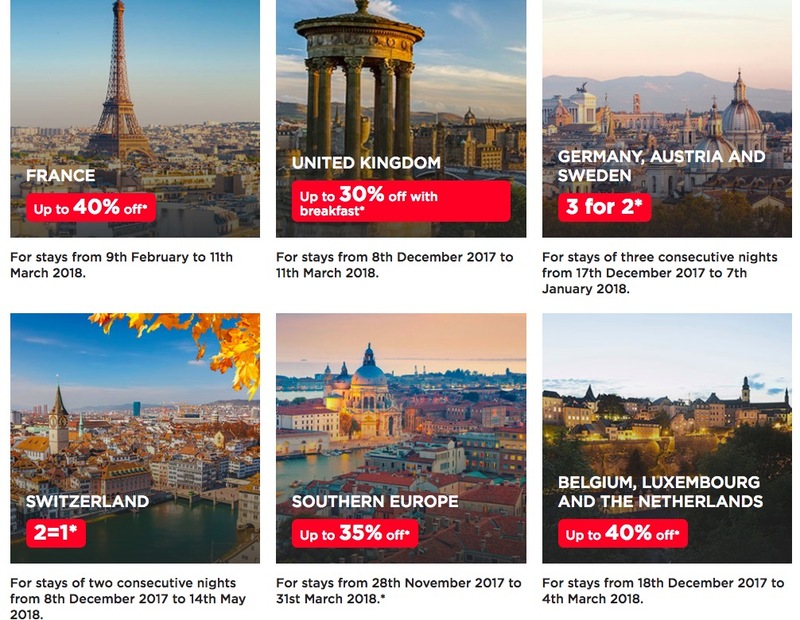 The Private Sale offer “Germany, Austria & Sweden: 3 = 2” offer is valid for bookings from 14th to 23rd November 2017 for stays from 17th December 2017 to 07th January 2018. The offer can only be booked on the websites AccorHotels.com, Sofitel.com, Pullmanhotels.com, Novotel.com, Mercure.com, ibis.com, HotelF1.com. The discount applies for bookings of 3 consecutive nights, valid for weekdays and weekends. The free night is calculated by applying a 33.33% reduction per night – based on the FLEXIBLE RATE for the dates requested upon booking – for stays of exactly three nights. Min./ max. stays: 3 nights. For hotels in Germany only: In case of non usage, earnings from a substitute accommodation contract, as well as saved expenses will be deducted. Private Sale in North America, Mexico, Peru and Ecuador! This offer is valid until November 23, 2017 for stays from November 27, 2017 to April 30, 2018. Save up to 30% off a minimum 2 night stay at Sofitel hotels in the USA and Canada. Save up to 30% off a minimum 2 night stay at Fairmont hotels in the USA, Canada and Mexico. Save up to 30% off a minimum 2 night stay at Swissotel hotels in the USA, Ecuador and Peru. Save up to 20% off a minumun 2 night stay at Pullman hotels in the USA. Save up to 30% off a minimum 2 night stay at Novotel hotels in the USA, Canada, and Mexico. Save up to 10% off a minimum 2 night stay at ibis and ibis Styles hotels in Mexico and the USA. Blackout dates apply. Offer subject to hotel’s sales conditions. Full deposit is required for ibis and ibis Styles hotels payable in advance by credit card at booking time. Full deposit is required for Fairmont San Francisco. Full deposit is not refundable even if the booking is cancelled or modified. One night prepaid non-refundable deposit for Sofitel, Pullman, Novotel, Fairmont and Swissotel hotels payable in advance by credit card at booking time. Client must provide credit card details to qualify for this promotion. No change or cancellation can be made after booking. Taxes not included. Surcharges apply for 3rd & 4th adults. Other hotel conditions may apply. The special “up to 30%” off discount is only valid at participating hotels across New Zealand, Fiji and French Polynesia. This offer can be booked between 14 and 23 November 2017 on AccorHotels Group websites for stays from 08 December 2017 until 04 February 2018. The special discounts are calculated based on a up to 30% reduction on the best unrestricted rate available each day over the chosen stay period. This offer can be booked from 14th November to 23rd November 2017 on AccorHotels Group websites. For staying dates, please see below each country’s sales conditions. The special discounts (from 20% to 35%) are based on the best unrestricted rate and are valid only in the participating hotels. Offer valid for all bookings made between november 14th and november 23rd 2017 on All AccorHotels group Websites for all stays of 2 consecutive nights between December 8th 2017 and May 14th 2018. The Private Sale in the United Kingdom offers up to 30%* off with breakfast** in participating UK hotels only. Offer is subject to availability. Promotion cannot be combined with any other offer(s). Offer is valid for bookings made between 14th to 23rd November 2017 for stays from 8th December 2017 to 11th March 2018 and when booked on AccorHotels Group websites. 30% discount with breakfast in participating ibis, ibis Styles, Mercure, Novotel, Pullman, MGallery and Sofitel hotels. *20% discount with breakfast at the Fairmont St Andrews. **20% discount without breakfast at all participating UK ibis budget hotels and The Savoy London. The booking cannot be changed, cancelled or modified. All reservations must be guaranteed with a credit card that is valid on the first date of your stay. Le Club Accorhotels members can accumulate points with this booking. Se me permite, sugiro primeiro entrar no site, ver o preço, e deslogar, e entrar no site normal da Accor, para evitar o golpe de locadoras, que armazenam no cache da sua máquina o preço mais alto e, depois, quando entra no site promocional, aparece o preço cheio. Verifique se o desconto realmente existe. No meu caso, reservei 3 hotéis diferentes na Suíça, no período de hospedagem da promoção, e em todos havia desconto conforme divulgado. Não tenho pontos na conta e não sei se tal promoção pode ser pre paga com pontos, pois essa opção não abre para mim. Num hotel que ficarei, Fairmont, não aceita pontos Le Club mas lhe retorna 12,5 por cada euro gasto somente em estadia, excluindo outros serviços. Neste hotel, especificamente, o desconto aproximou-se de 50%. Agradeço ao Celso pelo envio das dicas!